There's a new scam happening, and boy does it sound legit. It's so good I was almost taken in by it. What happened was I got a phone call from this gentleman with a Middle Eastern accent. He asked for me, and said he was from Microsoft Tech Support. I interrupted him (rude, I know, but better safe than sorry!) and asked him what version of Windows I was using, and warned him I'm a tech person. I admit I kind of let him think I have certification for it, just to see what he'd say next. Bad... Yes. Safety over sorry? Definitely. Until I asked him WHICH email address sent the "report". He said "Your gmail account sent it to us." That sent up a few red flags... I asked him WHICH gmail address and he sputtered a bit. You see, I don't have just this one, I have another one for backup in case this account ever gets hacked. He finally came up with "I can't confirm that, it's not in my records" and more red flags went up. I don't use either of my gmails as a contact email address for Windows. I use another free email provider. I listened to him go on and on again for a while and finally asked him exactly "what" exactly I had to do to "clean" the computer. He said to minimize everything on my desktop, look by the Ctrl key and hit the four paned Windows key on the keyboard while holding down the Ctrl and R keys. I didn't do it. That sounded pretty darn odd. You would think if Microsoft itself was really calling you, they'd tell you to go to their legit site instead of doing that. I finally had enough of his crap and said, "I don't trust this, it smells too damn much like a scam, sorry!" and hung up on him. I did a reverse number check and it said the number was "Unavailable". You'd think if it really was Microsoft calling, they'd show the number from which they were calling. I did download a security/malware checker from Microsoft's legit site and contacted their digital crimes unit. Nothing appeared on the scan. My computer is clean. The digital crimes unit replied to me without delays and told me I did the right thing. I'm so glad I listened to my gut instead of believing that. If I hadn't, hackers would have had the rest of my personal information and I would have lost a lot of money or other stuff. So, to all of you Windows users, BE CAREFUL. Windows does NOT call you for anything other than reasons specified on their site. Only scammers call for things like "your computer was hacked" for example. For more information, and to help you understand the difference between a scam and the real thing, visit the Microsoft Safety and Security Center. Monday wasn't an overly great day writing wise, only 1200 words. I had a few problems and wound up coming up with the right way to get things rolling. I spent most of the writing time jotting down ideas instead. Wednesday was a huge day for me... Only 2080 words of new stuff was added, BUT I finally spliced in a scene that had been waiting in the wings since the end of February! That was over 3000 words, even with compressions (some stuff had already been mentioned earlier in the manuscript, didn't want to repeat it!). Today, however, was the biggest day of all... I was in the middle of Chapter 15, and an intense scene was on the way... So I was at it pretty much as soon as the bus went around the corner this morning! The next thing I knew, it was 2 p.m. and time to stop. I had just gotten into a very intense part of the story and it was either stop or keep going, even though Son was getting off the bus in a few minutes and I have plans for the evening. Today's word count was over 5600 words... Chapter 15 was finished and I'm now in the middle of Chapter 16. If I had another four or five hours to write... Well... Y'all know I would have kept going! Maybe later tonight... I know exactly how things are going to play out, so I may get moving again once things settle down here. I'm so close to the "finishing line" of this one I can smell it. WOOT! Ever have one of those weeks when you did something and don't really remember how you got from Point A to Point B? *waves* I had one this past week, and I'm shaking my head at how fast things progressed, yet I don't remember doing all of it! My husband worked a couple of evening shifts this week, so while he was upstairs napping each morning, I dove into the writing. Although it wasn't easy, I managed to get Chapter 12 on the go, clean up bits of Chapter 1 that were bugging me, and keep going. Friday was the best day this week, it was a full day and I just wrote. 4800 words later, I came out of the fog long enough to get my son off the bus and went back to it. Chapter 13 was done in completion that day and I still can't believe how easy it was once I got into it... And the content of it. I know some of you out there are not going to believe I wrote this stuff when you finally get to read it, but I did... Yes, this seemingly sweet and innocent, vertically challenged rocker chick with a hidden geeky side knows how to write "that" kind of thing. Y'all will find out what I mean when it finally comes out, whenever that happens. I also did a word count on Eleven this past week, the first one since March. I was blown away by the progress in the last two months... I knew I was progressing quickly, but not this quickly with it! 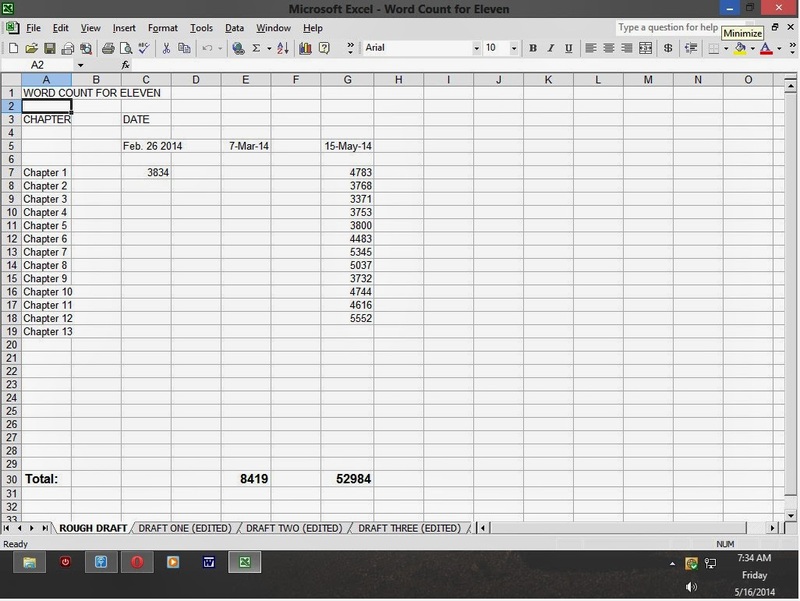 As you can see in the photo (screenshot of MS Excel XP Pro, which is what I use to keep track of things like this), I had almost 53K on Thursday, before Friday's big addition. Combine that with Friday's work and it's almost 58K. I'm over halfway to the maximum of 100K that most publishers in my genre prefer. The thing is, I may not come close to hitting that. Eleven is over halfway finished, plot wise, and depending on how things go in Chapter 14, I may be splicing in a huge key event that takes place not long before the lead-in to the final scenes of the story. Yes, I am that close everyone. It feels weird to be seeing the light at the end of the writing tunnel with a WIP barely three months after the initial idea was conceived... I'm sure my longtime readers and friends remember the four month drought I had between the initial idea of Family Portraits and when I finally got into writing that story... It was over three months. No Regrets (both books/parts) took well over a year for me to really get moving in it (close to two years in reality). I don't know... Maybe the simpler, shorter and lighter stories aren't that hard for me to write, now that I know how to do it. I am still learning though, and Eleven has been quite a learning experience for me so far. I'm not going to say that Eleven is "the one" that will see me finally published somehow, but even if only me and my beta team are the only ones who ever read it, at least I tried and will keep trying with different stories and projects until I hit the jackpot. Moving Along--Wait! Was That a Speed Bump or a Bloody Mountain? It's been one of those weeks where real life, the writing life and everything else just seemed to throw whatever it wanted at a lot of people I know. I am keeping all who lost loved ones this week in my thoughts and prayers. Canada's literary world lost one of its greats this past week also. Mr. Farley Mowat, author of "Never Cry Wolf" and "Lost in the Barrens", among so many other great books, passed away this week, only days before his 93rd birthday. I remember reading "Lost in the Barrens" and its sequel, "Curse of the Viking Grave", in elementary school, and loved both books. My thoughts and prayers are with Mr. Mowat's family and loved ones. He is going to be missed. I managed to get in a little writing time earlier this week, but after that, not much was going on until today. I'm not saying why publicly either. Hubby didn't work a full daytime shift this week, not even today. His schedule got changed around, which meant I had only a couple of hours to work, with an hour break in between things today. That said, between 2 two-hour writing sprees, I managed to get 2400 words added to Eleven, even with a rewrite of the last part of the scene I was working on last week and on Monday. (The scene was going down the exact road that a scene from another manuscript some publishers saw prematurely and I do NOT want to get stuck in a rut writing wise, so I changed it!) Things look better now and I'm "finally" into the full blown over 18 stuff. It's a relief to finally get there. I wasn't sure on how things in this one would progress in that particular arena other than there would be at least one or two graphic ones in the story. Not knowing kind of annoyed me too, because I like to have the majority of a story "mapped out" in regards to scene ideas by the time I'm halfway through it. I'm about halfway through Eleven now, if not more than that with the scenes that need to be spliced in. Not bad for less than three months of writing part time. Chapter 11's first draft is finished, and so far it looks okay for a first draft. I know it needs to be edited by someone other than me, and boy am I expecting a lot of creative/constructive criticism from my betas once they get it! That's okay with me. My editing STINKS to high heaven! I look at my most recent blog entry before this one and I'm amazed at my progress since I posted that (April 25th). Was it only a bare week ago that I was in the middle of Chapter 8? It feels like more time has gone by since then... I must have had a bigger writing fog encompass my brain than I thought. Sheesh. Well, things have been ultra nuts here this week. Hubby worked Monday, Wednesday and Friday daytimes, and was gone most of the day on Tuesday... So y'all know what I was doing. Ha. I can't remember my word counts from Monday through Wednesday without checking my writing thread in one of my forums and I'm too out of it to go back in there now, but I know before today, I had a 6400 word week, which isn't that bad. Tuesday: Finished Chapter 8, started Chapter 9. Wednesday: Chapter 9 done, started Chapter 10. Thursday: Rest and regroup day. Didn't do much other than chat with the local beta reader, play a few games in Facebook and mulled over the latest speed bump in the writing. Friday: Figured out how to get past it, but thanks to some technical difficulties with my computer, got thrown off the curve and had only an 1800 word day before afternoon bus time. 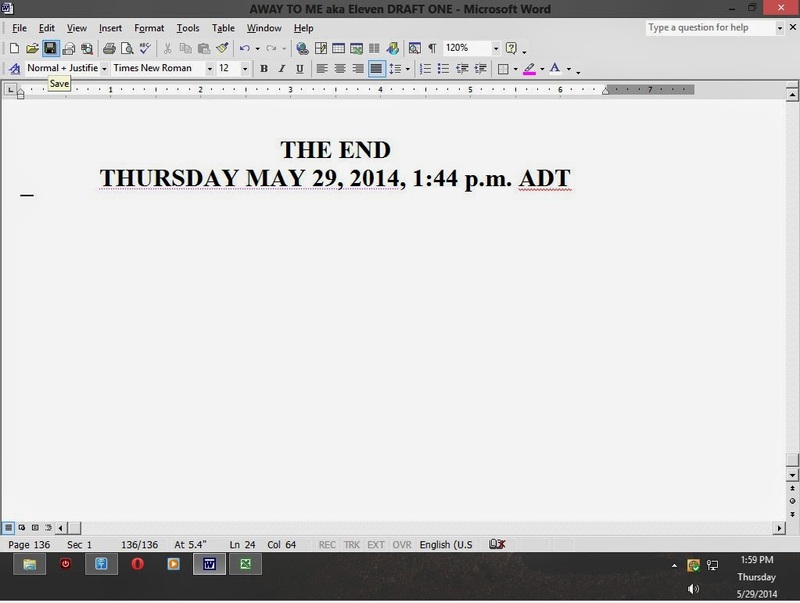 Wrote a short scene in main file and started a scene that would be spliced into the main file pretty soon. Wanted to get the basics of the start of it down before I forgot it!!! After school total: 8K for the week. Friday evening: Son had an activity evening and Hubby went with him. I stayed home and wrote. Chapter 10 finished and started Chapter 11. Now heavily into the "over 18" stuff finally. Word count total for the entire day: over 4800 words. Those extra hours put me up to an 11K word week. Pretty darn good considering all of the problems I've been having hitting speed bumps and the stupid computer going ballistic on me by times! I'm so foggy right now that a bomb could go off in my face and I probably wouldn't notice it. I've been going faster than the speed of light with this one, much faster than I was writing Family Portraits last year. This is nuts. When the writing bug bites and a story gets you in its grip, you're a goner. Backups were done at 10 p.m. ADT on external drive for the record. After this week's amount of words added, I'm NOT going to risk losing all of it! Next on the agenda: Finish that scene I started and spliced in today and figure out how to get from the end of that one to another one I started a while back! Have a great weekend everyone! I'm relaxing tomorrow, and we'll be watching Doctor Who reruns tomorrow afternoon. Gotta get my man in the blue box fix! Hehehehehehee!